An experimental cancer treatment cured this dog. Could it work for people? Our pets get sick in the same way we do. Finding cures for them is proving useful for us, too. DRAMBUIE THE GOLDEN RETRIEVER lies on his back on the floor, paws in the air, as his owner runs her hands over him. On this December night, like every night, Gina Alongi searches for sore spots and ticks, her fingers feeling for anything that might be amiss with her beloved dog. She starts with his chest and traces circles with her index and middle fingers down his torso. When she reaches the bare skin of his abdomen she pauses. She feels a small lump. It’s been eight years since Alongi flew to Ohio to buy a horse, only to come home with a new dog. Amid the thousands of quarter horses at this annual sale, one tent sold puppies. By the end of the day, there was a single one left. He looked so sad by himself. Alongi snuck him into her hotel room and then bought an additional plane ticket to fly him back to Westborough with her. Drambuie grew into a 115-pound blond bruiser with the thick coat of a yeti. He loves people so much that on many Saturdays, Alongi drives him to the local Lowe’s, where he parades up and down the aisles of wrenches and toilet seats and greets shoppers. On the way home, they stop at Honey Dew Donuts. Drambuie prefers plain Dew Drops. Each night she tells him, “Go to bed,” and he pads upstairs to her bedroom for his daily once-over. Alongi prods the lump. It’s hard, like a pebble. “I knew that wasn’t good,” she says later. She hardly slept that night. The next day, a Saturday, Alongi takes him to her vet, who biopsies the lump. Later, as Alongi is having dinner with her brother in a restaurant, her phone rings. It’s the vet. Drambuie’s lump is a sarcoma, a type of cancerous tumor that grows in the body’s soft tissues and can be deadly. She bursts into tears, grabs her purse, and leaves her brother and dinner behind. Drambuie’s prognosis is grim, and treatment needs to happen quickly. 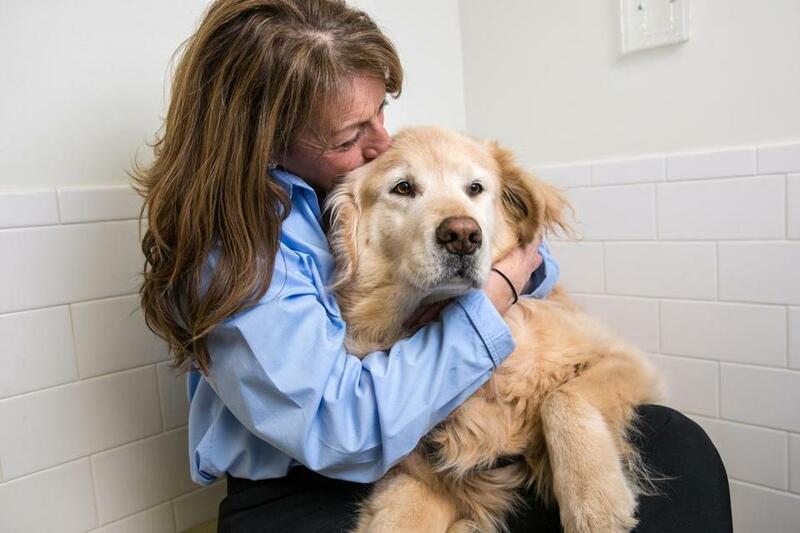 Alongi takes him to Tufts University’s Cummings Veterinary Medical Center in North Grafton, even though she called and was told there is no oncologist on duty on Sundays. On Monday an oncologist schedules surgery for Tuesday, but also sends her to talk to Dr. Cheryl London, a veterinary oncologist and research professor at Tufts’ Cummings School of Veterinary Medicine, about a clinical trial for a new sarcoma treatment. As Alongi wipes away more tears, London explains that she is testing a form of immunotherapy, a treatment approach that enlists a patient’s immune system in the fight against cancer. She wants to inject Drambuie with a piece of DNA that will essentially unmask his tumor, in hopes his immune system will then destroy it. There will be no charge to Alongi. But he might suffer side effects. Though it will mean delaying the surgery to remove his tumor by a month, the treatment might cure him. And if it does, it might cure people, too. Alongi hesitates, then says yes. Gina Alongi with Drambuie during a visit to Cummings Veterinary Medical Center in North Grafton. LONDON IS A PIONEER in a growing movement within comparative medicine, one that looks to our pets to find answers to our ailments, from kidney disease to heart failure. Laboratory mice have long been the standard animal model for research, in part because they can be bred quickly and given distinct genetic traits. But it’s become clear the system is much better at producing drugs that cure diseases in lab mice than ones that work for humans. More than 80 percent of clinical trials for human patients fail; for cancer, the failure rate is 90 percent. Those studies can cost many millions of dollars, which make them a huge financial risk for pharmaceutical companies and contribute to the high cost of drug development. Meanwhile, the agencies that fund research want more of their dollars to translate into drugs that work. There are plenty of reasons why using mice to research human disease is not more successful. The animals are injected with the disease being studied, rather than getting it spontaneously. They live in a controlled, sterile environment, and their life span of one to two years is far shorter than the time it takes some humans even to develop a disease. London points out that mice don’t vomit, so that will never show up as a possible side effect when testing a drug on them. Dogs not only are expert vomiters but also lead lives much more like ours than other animals do. They share our environment, drinking the same water, breathing the same air. They also share more of some crucial parts of our genome than lab mice do. Most importantly, they come to medical trials because they are already suffering from an illness — and many of their ailments are the same ones that plague humans, from spinal cord injuries to congestive heart failure. They develop many of the same cancers, including lung, bladder, and melanoma, as well as sarcomas. Soft tissue sarcomas are challenging to treat in dogs and humans. The tumors are difficult to remove surgically because they grow in problematic locations and have tentacles that may reach into joints. Chemotherapy often has little effect. Tufts is working with Jounce Therapeutics, a Cambridge-based biotech that develops cancer treatments, including the experimental immunotherapy that London is testing. If it works in dogs, says Emma Lees, Jounce’s senior vice president of research, it is a good indicator the approach might work in people. Even if it doesn’t work for dogs, they may learn something new about the cancer. In December and early January, Alongi drops Drambuie at the North Grafton hospital each week. During his first visit, the DNA therapy is injected into his marble-sized sarcoma. On his follow-ups, London’s team looks for changes in his health and the tumor. At home, Alongi watches for side effects, but sees none. In fact, he becomes more energetic. Better yet, Alongi can feel the lump shrinking. About a month after the injection, a surgeon operates to remove what is left of his sarcoma. But none could be found — it had vanished. Drambuie is cured. “This is a really remarkable response,” Lees says. Dr. Cheryl London shares a moment with Drambuie. His participation in a clinical trial saved him from cancer. AMIDST HER GLEAMING, ROOMY LAB at the hospital, London struggles to balance atop a stool while holding on to a pair of crutches (she broke her leg this winter when she fell down some stairs). Though London became a vet because she loves animals, now she spends most of her time in this lab or another in downtown Boston, analyzing data or talking on the phone or sitting in meetings. But she can help more animals this way, and also humans, a prospect she never considered years ago when she decided to become a veterinarian. Far too often, she had to break bad news to pet owners: Their dog had cancer, and she had little hope to offer. Though cancer is the leading cause of death for dogs, there are few effective treatments, and that set London on a mission. She returned to school to study veterinary oncology at the University of Wisconsin-Madison, and followed that with a doctorate in immunology from Harvard. It was at Wisconsin in the early ’90s that London first heard about comparative medicine. Veterinarians believed clinical studies with pets could inform human medicine and vice versa. But doctors and pharmacological companies were far less convinced. Even those who saw the link then, says Dr. George Demetri, director of the Center for Sarcoma and Bone Oncology at Dana-Farber, didn’t see a practical way to carry out clinical trials with pet dogs. It was hard enough to get humans to sign up. London was undeterred. Her studies and those of others began to change minds. In 1999, when she was an assistant professor at the University of California, Davis, she ran a study on mast cell cancer in dogs. Research in humans and mice had found a specific genetic mutation in mast cell tumors, a type of white blood cell cancer that is rare in people but common in dogs. London’s study proved dogs also had the mutation. Her team went on to help create Palladia, a drug to treat mast cell tumors in dogs, and the first cancer drug specifically approved for dogs. The research also contributed to the development of Sutent, a drug for kidney cancer in humans. Both were brought to market by Pfizer. 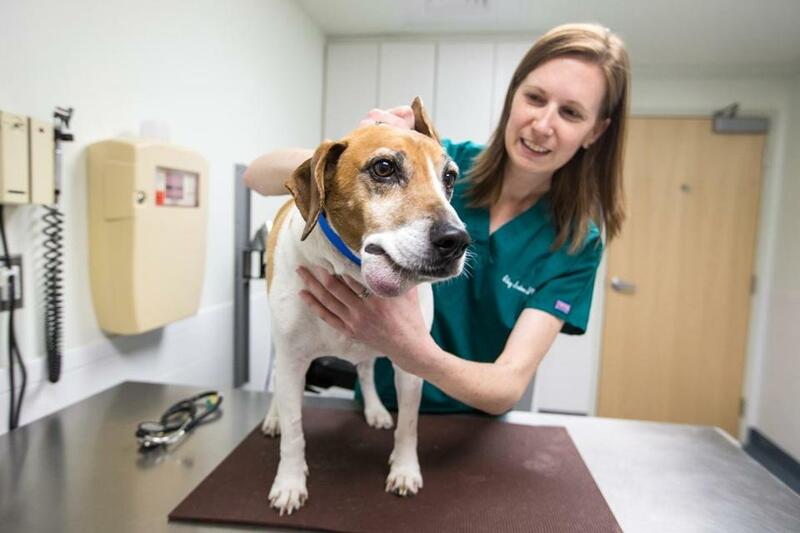 As part of the clinical trial, veterinarian Abbey Sadowski examines Donnie, a beagle mix with a sarcoma on his jaw. London went on to study a compound for dogs with lymphoma, which yielded Verdinexor for dogs, now in phase 2 clinical trials, and informed work on Selinexor for human lymphoma, also in trials. Scientists at the University of Illinois at Urbana-Champaign tested PAC-1 on dogs with the brain cancer glioblastoma, and then PAC-1 went into trials on human patients. Researchers at the University of Pennsylvania used an immunotherapy agent (ADXS-HER2) to treat osteosarcomas in dogs, and it is now being tested for human use. Osteosarcomas remain a challenge. “We lack enough insight into [this] disease to know how to select which drugs are the most promising,” says Katherine Janeway, a pediatric oncologist at Dana-Farber/Boston Children’s Cancer and Blood Disorders Center. For humans, osteosarcomas are uncommon, with fewer than 1,000 cases a year, about half in children and teens. For dogs, they are common, with 25,000 cases a year. And while the cure rate for children has remained at 60 to 70 percent for three decades, the prognosis for dogs is far more dire: 90 percent die within two years of being diagnosed. Janeway and London joined forces two years ago, just after London came to Tufts from Ohio State, on an osteosarcoma study and clinical trial for dogs. By comparing genetic abnormalities in dog osteosarcomas with those in children, the scientists hope to better understand the cancer and finally learn how to treat it, in both species, with immunotherapy. “We are trying to use trials in the dogs to get a signal, of the five or six things we could study, to show us which is the one that is the most promising,” Janeway says. The National Cancer Institute runs a network of 24 academic research institutes, including Tufts’, across the country to share information from comparative clinical trials. There are comparative clinical trial programs at Tufts, Penn, Ohio State, Colorado State University, and the University of California at Davis, among others. Most studies use dogs, though cats are also used. London has helped secure Tufts’ place at the forefront of this aspect of medicine. In addition to working with Dana-Farber and Boston Children’s Hospital, she has linked up with researchers at the Broad Institute in Cambridge, at MIT, and at The Jackson Laboratory in Maine. As director of the clinical trial program at Tufts, she has expanded the number of comparative trials underway — there are currently 12 — all at no charge for participants. In some trials, a dog may receive a placebo, but then is given the treatment at no cost at the end of the study. Some trials study a single aspect of a disease, such as one looking for early indicators of kidney disease, and do not provide a possible cure, unlike London’s sarcoma study. 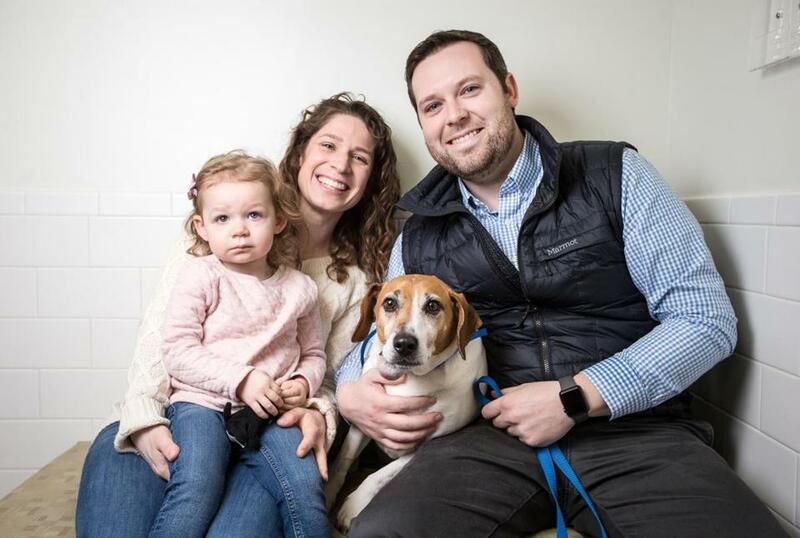 Tufts draws on an alliance it has with 13 veterinary hospitals around the country to run studies at multiple locations, enabling more sick dogs to be enrolled quickly. Sick dogs never seem in short supply. Donnie’s owners, Patrick and Eileen Livermore, say the tumor doesn’t seem to bother him. He still eats without a problem and tags along after their 2-year-old, Eloise. ON A SNOWY APRIL MORNING, Donnie, a beagle mix, steps into one of the Cummings hospital’s small examining rooms. Dogs in casts, bandages, and plastic cones stream past the room’s open doorway. Donnie, eyes slightly pinched, seems too nervous to notice. He’s here because of the fleshy bulb that projects from his lower jaw, a soft tissue sarcoma. Donnie’s owners, Patrick and Eileen Livermore, say the tumor doesn’t seem to bother him. He still eats like a beagle, with abandon, and follows their 2-year-old, Eloise, wherever she wanders. The Lynn couple signed Donnie up for the clinical trial because removing the sarcoma surgically would be nearly impossible, at least without taking a chunk of his jawbone, too. Standing on the tile floor, Donnie pants lightly as Dr. Abbey Sadowski, a veterinary resident who works with London at the hospital, kneels to measure his bump with metal calipers. Eloise rewards Donnie with a sticker on his rump. “It’s the same,” Sadowski says. So far, the DNA injection hasn’t made Donnie’s tumor any smaller. Still, it hasn’t gotten any bigger, which is good news. All the dogs in the study have had a different response, and one of the questions London hopes to answer is why. Donnie is led off for a biopsy. After Donnie disappears down the hall, Gunther, an unflappable, ginger-colored terrier mix, pads into the examining room. He doesn’t even seem to notice when a large, gray dog passing in the hall lunges through the exam room’s doorway before being pulled back. Gunther’s owner, Sean Kilcoyne, says Gunther likes to sleep on the back of the couch in the sun, like a cat. He sits on the middle armrest in Kilcoyne’s pickup truck as the contractor drives to construction sites. He doesn’t mind when Kilcoyne’s wife dresses him in costumes, like the mini New England Patriots T-shirt she pulled over his head for the Super Bowl. It was about then that Kilcoyne, who lives in Clinton, noticed a large lump on his terrier’s back, near his tail. It rose almost overnight. By the end of the week, the mound was as big as a half-grapefruit. Their vet had only bad news. The cancerous tumor was so large it could not be removed. Chemotherapy was likely to extend Gunther’s life only by months. Kilcoyne called his son, who grew up with Gunther. “It doesn’t look good,” Kilcoyne told him, but there was this clinical study at Tufts. 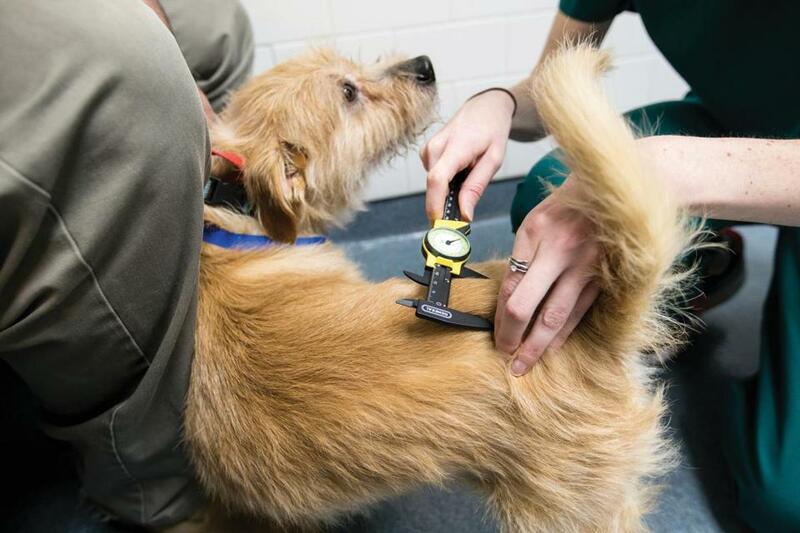 Gunther the terrier mix leans against his owner while his sarcoma is measured at Tufts’ Cummings Veterinary Medical Center. Aside from Drambuie, Gunther has had the best response to the treatment. After two injections, his sarcoma is hard to see. As Sadowski pinches with her fingers to find its edges so she can measure it, Gunther looks around the room. Sadowski thinks it may be small enough to remove surgically. To be sure, she orders a CAT scan. Later that afternoon the terrier is anesthetized and his still body disappears into the great machine. As it whirs, what’s inside Gunther becomes visible and the cancer’s secrets are revealed. The tumor is like an iceberg. There is far more of it below the skin line. Surgery is still out of the question. London will try a third injection on Gunther. She’ll keep giving him the injections until the terrier’s tumor disappears or no longer responds. Whatever happens, London will have learned something about the therapy or the cancer that may help both dogs and humans in the future. But for now, amid all the big scientific questions, sits one small dog whose life hangs in the balance. Can this treatment save him? The other dogs? London hopes so. How did we become such shameless dog spoilers? Amy Sutherland is a best-selling author in Charlestown. Send comments to globe@magazine.com. Get the best of the magazine’s award-winning stories and features right in your e-mail inbox every Sunday. Sign up here.